Lehman's Old-Fashioned Hardware Store at Kidron in Ohio's Amish Country is a fascinating place. This store has specialized in non-electric appliances for more than forty years. Until recently most of its customers have been Amish residents in Holmes, Wayne, and Tuscarawas counties and Christian missionaries in countries of the developing world. The store is appealing to a growing number of religious people caught up in the so-called prophetic teaching that the last days are fast approaching. They have read about the store in books and on internet websites, and they are buying materials to prepare for what they believe will be disruptive times. The Lehmans themselves are not worried about this being the end time, but apparently many other people are. I am with the Lehmans. I do not fear the future nor do I see it as our task to try to predict the date of Jesus' return or to signal out specific people who will be leading figures in the last day. Our biblical text today expresses clearly that no one knows when the end time will come; not even Jesus knew as he spoke to his disciples a short time before going to the cross. On the positive side Jesus does tell us how we should prepare for the last day, in fact prepare for every day. We do this by "keeping awake." The sun will be darkened, and the moon will not give its light; the stars will be falling from heaven, and the powers in the heavens will be shaken. Jesus then tells a parable of the fig tree signifying that "summer is near" -- a time of promise, fulfillment, and hope. The biblical passage concludes with another parable in which Jesus tells of a man going on a journey who leaves his servants in charge while he is gone. They do not know when he will return. The doorkeeper is commanded to be on the watch. The only way the servants can be sure of their master's praise when he returns is to be on constant watch. This does not mean they sit around doing nothing and only scan the horizon. No, they are to do their assigned tasks with faithfulness. If they do that, they need not know the precise time when their master will return. Jesus concludes the story by speaking to his disciples and saying, "What I say to you I say to all: Keep awake" (Mark 13:37). Other references in the gospels confirm Jesus' warning. Matthew elaborates more in his account and spells out the consequences of not keeping watch in graphic detail (Matthew 24:36-51). Matthew also follows up this section that is similar to Mark with a new parable of the wise and foolish maidens underscoring the same point. Luke in his gospel concludes with a similar challenge: "You must be ready for the Son of Man is coming at an unexpected hour" (Luke 12:35-40). What do Jesus' words have to say specifically to us as we enter the Advent season? Despite Jesus' explicit warning not to be concerned about the date and the details when the last day will arrive, some of his followers in every generation since the first century have sought to determine when this cataclysmic event is going to take place. One of the most bizarre examples of misplaced fervor happened in the 1840s in western New York. This time and place has frequently been called "The Burned-over District" because of the repeated religious revivals that occurred during the first part of the nineteenth century. William Miller studied biblical prophecy and he was certain from his calculations that Jesus would return on March 21, 1843. Many of his followers went out into the open fields or gathered on the hilltop to await this spectacular event. Nothing happened! Even in our own generation prophetic teaching abounds. Ever since the state of Israel was formed in 1948 prophetic teachers have become more certain than ever that we are living in the last days. In their interpretation of the scriptures the major events leading up to Jesus' return will take place in the land that is now the state of Israel. Some predictors set definite dates; others set a date just a few years ahead hoping if it is not the right date, people will forget about the original forecast. In the meantime, not a few people are filled with extraordinary expectation or dread. In addition to date setting, it is common among such "prophetic" teachers to single out particular world personalities and associate them with symbolic figures in the gospels, the letters of Paul, or the book of Revelation. In my lifetime I have heard so many speak with certainty that the Anti-Christ was Hitler, Stalin, Mao, Saddam Hussein, or whoever happens to be the current dictator of choice. Not long ago one of our most prominent TV evangelists claimed the gigantic computer in Belgium used to process information in the world financial markets actually is the "Beast" mentioned in the book of Revelation. Someday, the TV evangelist warned, the computer will fall into the wrong hands and wreck the world economy leading to chaos and eventually to the final battle of Armageddon. Rather than seeking to predict definite dates or try to relate current personalities with the symbols of the apocalyptic sections of the scriptures in contradiction to Jesus' explicit command, how much better to continue with our assigned tasks of discipleship whatever they be with faithfulness. One of the best ways we can maintain a balance and not go off on tangents in the midst of the current world's uncertainty and unrest is to worship regularly and have our worship guided by the festivals and seasons of the Christian year. In this way, we will stay close to Jesus, our Lord, and not be distracted by the latest fashionable fad in the deceptive domain of prophecy. We do not want to be like this man. We want to keep awake, not worrying about the details of the end time but focusing upon the present. We are looking for God's next visit, whether or not it is God's last visit. 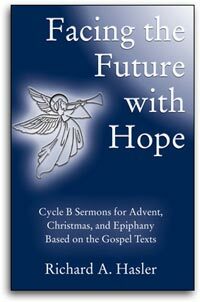 "Keeping awake" is the hope of the Advent season. Amen. 1. Whitney R. Cross, The Burned-over District: The Social and Intellectual History of Enthusiastic Religion in Western New York, 1800-1850 (New York: Harper & Row Publishers, 1950), 287-321. 2. G.K. Chesterton, Orthodoxy (New York: John Lane Co., 1908), 29. 3. Walker Percy, The Second Coming (New York: Farrar, Straus & Giroux, 1980), 124.